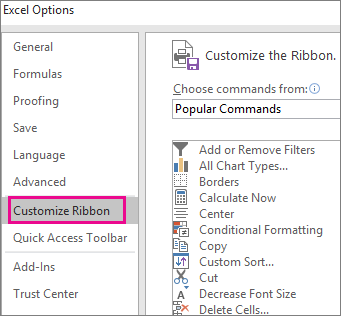 Important: Power View has been removed from the ribbon in Excel for Windows, however the interactive visual experience provided by Power View is available as part of Power BI Desktop, which you can download for free. 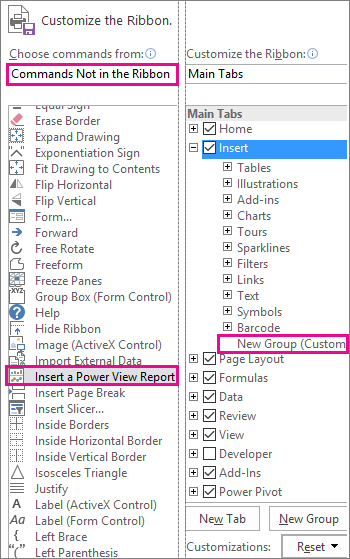 You can easily import existing Power View reports to Power BI. While Power View is still available, you may need to update Microsoft Silverlight, as it is now turned off by default. To turn on Power View, follow the steps below. On the File tab, choose Options > General﻿. In the Office intelligent services section, turn on Enable services if it is not already enabled﻿﻿. In the Main Tabs group, click the tab where you want to add the new group, and click New Group. Next, select the Choose commands from option, click Commands Not in the Ribbon, choose Insert a Power View Report from the list, and click Add. You can use the Up/Down arrows to the right of the Main Tabs group to move the new group if needed. 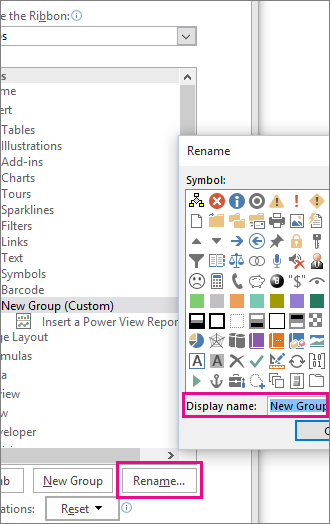 With New Group (custom) selected, click the Rename button, and in the Display Name box enter the name you want for your Power View group, like "MyReports". To finish, click OK twice. 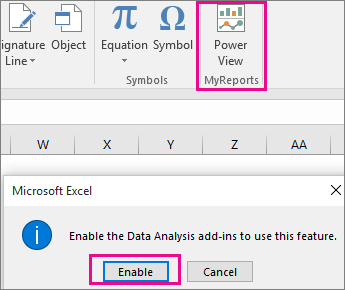 The first time you insert a Power View sheet, Excel you'll be prompted to enable Data Analysis add-ins, so click Enable. You may also be prompted to enable Silverlight. If you still receive a prompt after that, you might need to use registry keys to unblock Silverlight. If you still have issues after that, you should consider moving to Power BI Desktop, as it is a much more feature rich application.